Respected publication Car and Driver ranked the 2016 Honda Odyssey as the #1 Minivan, an honor sure to carry over for its 2017 model. 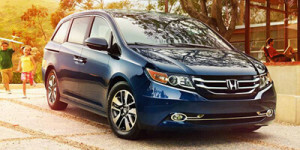 Coronation as the King of the Minivans is a feather in Honda’s cap. Formula Honda Toronto cordially invites you to the unveiling of the 2017 Honda Odyssey. Expected to arrive at the end of the year, we’re certain you won’t be disappointed! Why a minivan over the sportier SUVs on the market? For starters, there’s ample room with three rows of seating, holding up to eight passengers. Even adult passengers can fit easily in those rear seats, with plenty of head room. That’s something that you won’t find in a typical SUV. Honda didn’t scrimp on the cargo space either, with 38 cubic feet of cargo capacity behind the rear seats. Compare that to what is offered in an SUV. Note that the third row is easily folded down into the cargo space. The second row can be removed to make even more room. This is ideal if you want to move all your freshman’s belongings into the college dorm. For families with small children, what’s not to love about the built-in vacuum? Pure genius, the vacuum is available in the SE and Touring Elite models. Soccer moms everywhere, rejoice! Who says a minivan has to be mundane? Starting with the 2017 Honda Odyssey EX-L model, you get leather interior, heated seats and a sunroof. The Touring model adds built-in navigation. For the top of the line Touring Elite, you get a state-of-the-art audio system and a larger entertainment screen measuring 16.2 inches. Don’t forget about the vacuum! The 2017 Odyssey projects that the front-wheel drive minivan with a 3.5 liter, 6 cylinder engine will improve fuel efficiency. Other features not to be overlooked are the power sliding doors, backup camera and heated steering wheel. We also anticipate implementation of the Apple CarPlay and Android Auto features, as well as some Honda Sensing safety technology available on several of the 2017 trims. For safety, functionality and performance, you just can’t beat the Honda Odyssey. Check out our clearance specials on the 2016 Odyssey models or usher in the New Year with the brand new #2017HondaOdyssey. Stop by #FormulaHondaToronto for a complete selection of Honda vehicles and experience what it’s like to be King of the Road. Our Sales and Finance teams can even arrange for you to drive it off our lot today! For all your automotive needs, visit our website at http://www.formulahonda.com.